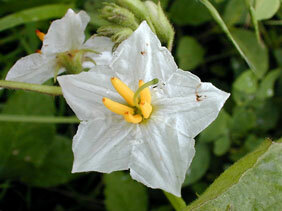 Stems: Erect, slender, sparingly branched, covered with tiny star-shaped hairs; spines yellow, up to 1/4 inch long. Leaves: Alternate, simple, short-stalked, broadly elliptic to ovate, 2 to 6 inches long, 1 to 4 inches wide, star-shaped hairy; margins wavy toothed or shallowly lobed; prickles on midribs and veins. Inflorescences: Raceme-like, 5-20-flowered, in leaf axils. Flowers: Calyces bell-shaped, lobes 5, lanceolate, star-shaped hairy; corollas widely spreading, 5-lobed, .75 to 1.25 inch wide, white to pale bluish lavender; stamens 5, anthers thickened, yellow; tips coming together, enclosing style. Fruits: Berries, spherical, 1/2 to 3/4 inch in diameter, yellow; seeds numerous, egg-shaped, yellowish. Habitat: Dry, disturbed sites, waste areas, overgrazed pastures, open woodlands, and cultivated fields, on sandy or gravelly soils. Toxicity: The berries are poisonous to humans and livestock. Uses: Though the berries are poisonous, pheasants, quail, prairie chickens, and wild turkeys consume the mature fruits and seeds. Many years ago the fruits were used as sedatives and antispasmodics to treat epilepsy. Native Americans mixed crushed leaves in milk and left the mixture to attract and kill flies. Comments: Carolina horse-nettle can be a troublesome weed. When the top is removed, the roots and rhizomes send up new shoots. See Western horse-nettle Solanum dimidiatum.